This post has moved to my new internet home! This post has moved to my new home on the internet! It seems as though the books that grab hold of us the tightest are the ones that are the hardest to write about. 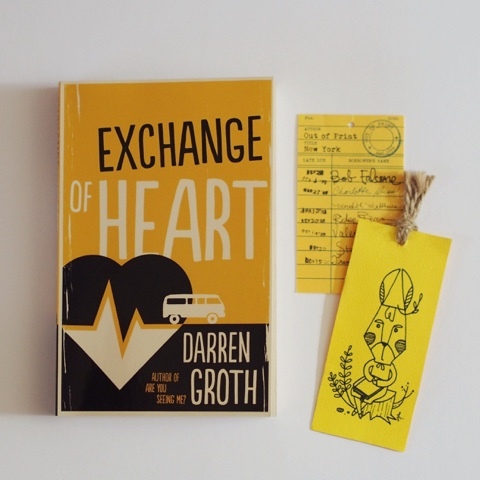 This is certainly true of Exchange of Heart, Darren Groth's newest novel for young adults. Even though I'm just a plain old adult, without the blissful 'young' prefixed to the front, this book sits with me in a way few contemporary books have. And I've wrestled for some time with how to write about it because it just feels so much, and it's hard to disentangle myself from the story. 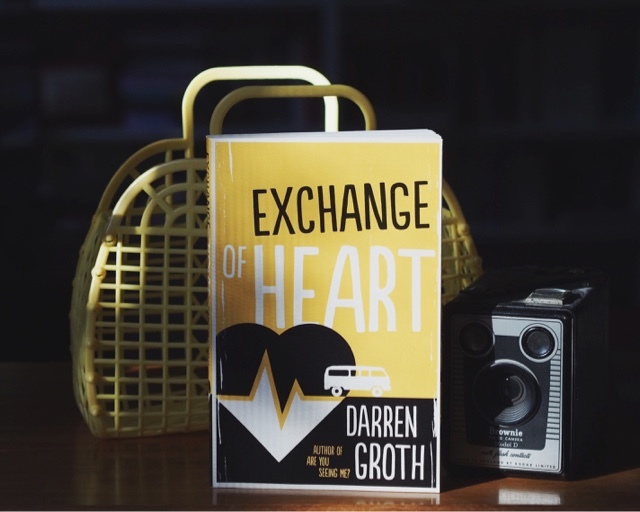 To begin with, Exchange of Heart is set predominantly in Brisbane, and books populated by familiar places and landmarks and journeys are like new friends who instantly become old friends. Then, too, its main character, Munro, is wrestling with an anxiety that is hard to name and, although my experience is different to Munro's, I know this battlefield all too well. Most heart-squeezing of all, though, is the fact that Munro is mired in grief after the death of his younger sister Evie, who has Down Syndrome. My youngest brother has Down Syndrome, and, ever since he joined our family, I have had these occasional dreams of terrible natural disasters threatening him: volcanoes spewing lava, tsunamis sweeping over everything, earthquakes upending the ground we're struggling to walk on. Always I find myself urgently reaching out to keep hold of his hand, to grab on to him and not let go. Even in my subconscious mind, losing my little brother is one of the most incomprehensibly awful things that could ever happen. So to see a character grappling with this reality was like a beautiful, heartbreaking kick to the stomach. Munro's grief and confusion is tangible, a living thing that haunts him, taunts him, and threatens to overwhelm him, to rob him of the people who love him best and to sabotage any attempt to begin again. Blessedly, these people also refuse to let him stand alone in the depths of his grief, and it is through their love -- faithful, hard love that patiently makes its way through the walls of trauma Munro has built up around him -- that Munro can begin to see the possibility of healing. Of course, it takes an international journey and a rag-tag gang of Australians to begin dismantling those walls, and each fresh character bursts into the story like a happy surprise. These are not perfect characters, but they are good ones, drawn in a way that doesn't make a novelty of their personalities or disabilities but, rather, honours them. This book is disability-positive in a very joyful, honest way. It's also therapy-positive and family-positive. In fact, even though it will make your heart squeeze up inside your rib cage, reading this book is a positive experience in itself. And now, after all my wrestling, this isn't even a real review -- just a slightly frantic whirl of feelings -- but I'm glad this book exists and I hope you read it. The short stories that have stayed with me over time are the ones that make me gasp at an unexpected revelation, or sigh when two essentially disparate things (people or ideas or beliefs or understandings or accidents) come together in a way that is both surprising and just right. But my absolute favourite stories are the ones that manage to plumb the depths of human brokenness and this dark world yet still point to a shining glimmer of grace in the midst of it. So I was a little bit in love with That Stubborn Seed of Hope before I even started reading. The title, pulled from a quote from Bridge to Terabithia (again: LOVE), encapsulates my philosophy of story, and speaks to one of the things I treasure most in children’s and YA fiction. It might stem from the fact that I dined quite heavily on Anne of Green Gables growing up, but I firmly believe that while children and teenagers are forced to look tragedy and heartache and confusion squarely in the face just as frequently as adults, there is often also a beautiful spark of hope intrinsic within youth that promises something more. The best children’s and YA fiction reflects that. While not shying away from grief and grit, it also promises, sometimes in just a whisper, that the story doesn’t end here, that it’s possible to get knocked down and get up again. That Stubborn Seed of Hope does this admirably. 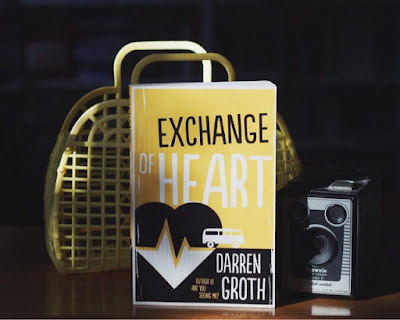 While the stories are unconnected in terms of characters, voice, setting, genre, and events, they are linked in that they stare roundly at something frightening – disease, death, shame, loss – while also offering up a kernel of hope. The voices of Brian Falkner’s characters are alternately cynical, wistful, angry, insecure, bewildered, and even sinister, but there is a warmth to these characters that’s endearing and compelling. "I Am 17" is something like Gregor Samsa meeting Benjamin Button. "The Kiss" reveals a post-apocalyptic Australia -- life, but not as we know it. "Strawberry Lou" is a tiny tale that packs an emotional whallop. "Sins and Griefs" explores blossoming sexuality, otherness, and the longing for belonging. The rest I’ll leave you to discover on your own. I loved each one, but I particularly enjoyed the stories that focus on sibling relationships. There just aren’t enough love stories about families. In this collection, some of the pieces are funny, others deeply sad. Regardless of outcome, each story offers an emotional gut punch and the reassurance that life is rarely all good or all bad, but usually a little of both at once. 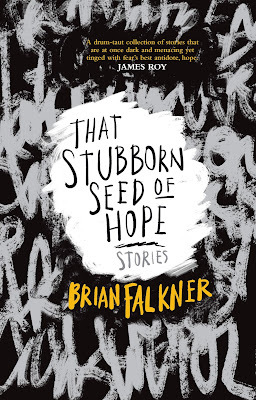 The author declares in his introduction that “[w]e can endure almost anything in our lives as long as there remains that stubborn seed of hope.” These stories are a compelling, readable, deliciously-written and ultimately courage-giving testament to that. 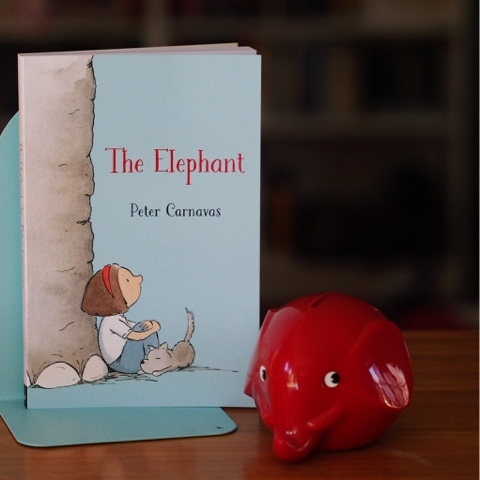 As I read Peter Carnavas's The Elephant last month, I constantly caught myself flickering forward in my imagination to a time when I'd share this book with my nieces. Honestly, I can't think of higher praise to offer a book than this. Olive, the star of the story, is a true heroine. She's bright, intelligent, and thoughtful, and she just knows that if she works hard enough and finds the right spark of joy, she can scare away the lumbering grey elephant that follows her father around, weighing him down and making him too heavy to see the wonder of the world around him -- or, indeed, the wonder of the tiny world in front of him in his daughter. "See, my dad has this really big sadness. He's had it for a long time. And I imagine the sadness is like a big grey elephant following him around. That's what I see." "Like an imaginary friend?" Arthur asks. No, Olive tells him, "Like an imaginary enemy." Arthur is intrigued, and offers Olive a glimmer of hope: if she can fix her dad, he'll be really her dad again. So that's what Olive sets out to do. She's helped in her efforts by her Grandad, who lives with Olive and her father, and helps fill some of the hug-holes in Olive's life. But he's not her dad, and he can't see the elephant. Only Olive can. Olive's attempts to make her dad happy are told in exquisite phrases, the kind you want to roll around and taste on your tongue. Olive's imagination is vividly alive; she sees "milkshake clouds", a bike that "must have been something wonderful when it was young, when it was alive." Her grandad looks like "a skinny scarecrow, his old straw hat full of holes." Alongside the word-pictures are joyful, beautiful line drawings that add a further layer to the story and help build towards a final gentle surprise. 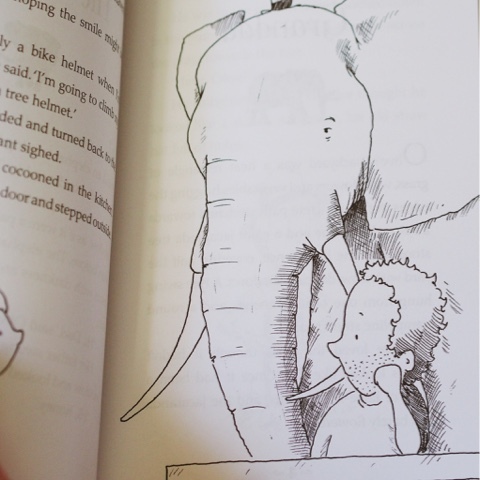 Olive's story offers a hopeful ending, but it also paves the way for discussions about the loved ones who may not find easy answers for the elephant that dogs them, people who cannot be made happy again. 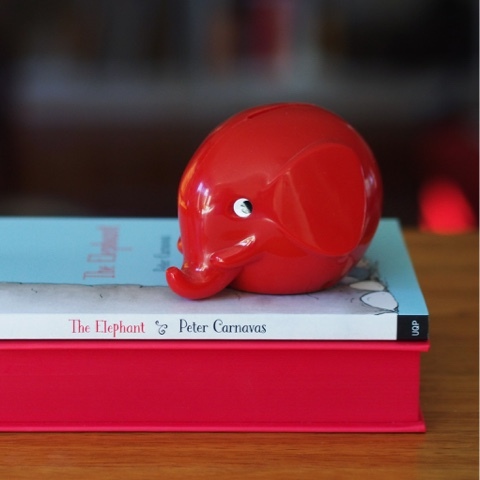 While never using the words "depression" or "grief", The Elephant nevertheless manages to explore these concepts through a story that is beautiful in its simplicity yet never dumbed down. It depicts self-comfort and a believable coping mechanism in a way that's full of gentle revelations. It manages to be childlike but never cloying or saccharine, full of Australian sensibility but universal themes. This book is a rare treasure.